The great closing concert of tuned city Brussels 2013 ma-ta-ta-bi by Akio Suzuki + Aki Onda was just released by ORAL_records Montreal. Read the conversation of Akio and Aki about this project. 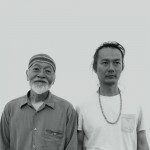 “Amazing clash and collaboration of two giants of Japanese Sound art and improvisation. A new duo who is there to stay for a long…. long… time !